Amazing 10 Minute Action Clip from Episode 1! View on YouTube to select English Subtitles! Special thanks to Luis and Kyosyo! 1/72 Scratch-Built "Cosmo Falcon" Model! 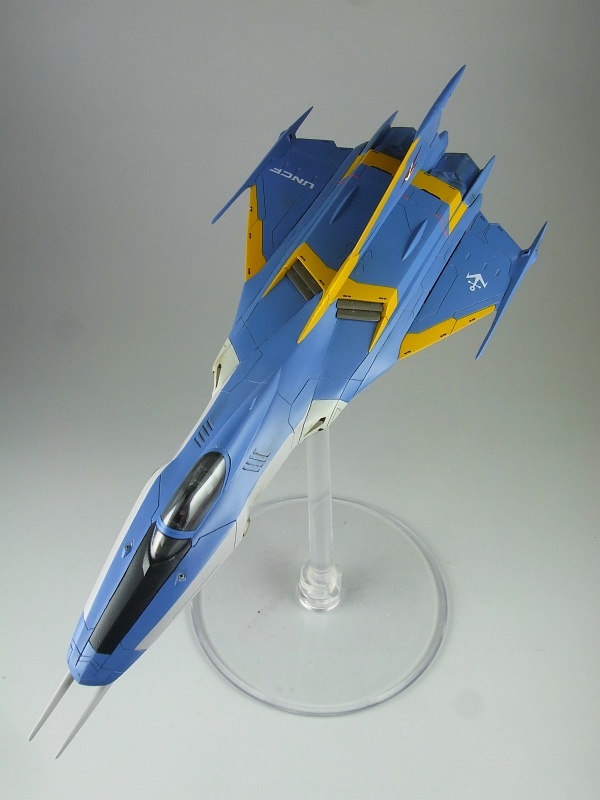 KuWa's scratch-built 1/72 Cosmo Falcon space combat fighter. The May Issue of Dengeki Hobby Magazine (on sale now in Japan) features a special spotlight on SPACE BATTLESHIP YAMATO: 2199, and naturally, there are going to be several beautiful layouts of photography with models based on the new series. The previously-released 1/500 scale Yamato (based on the YAMATO: 2199 version) is to be reissued by Bandai as an official YAMATO: 2199-related product. Hopefully, the series will be a success and we'll see model kits and other merchandising from this exciting and faithful remake. For one, I'd like to see the re-imagined Black Tiger space combat fighter, dubbed the "Cosmo Falcon". Undercarriage detail on KuWa's 1/72 scratch-built Cosmo Falcon. Named after the Nakajima Ki-43 Hayabusa (or "Peregrine Falcon"), the Cosmo Falcon was conceived to replace the original Black Tiger (while invoking it's basic shape) to better match the Type-52 Cosmo Zero space fighter from the 1974 series (itself named after the Mitsubishi A6M Zero), which has been carried over for YAMATO: 2199. On his blog this past weekend, the modeller known as "KuWa", featured these two photos on his blog, Frame Out, and briefly described scratch-building this "Cosmo Falcon" in 1/72 scale for one of the Dengeki Hobby layouts — so, here are two photos of his scratch-built beauty. Hopefully, if the stars are aligned, we can look forward to an official kit (and a lot more) in the near future! 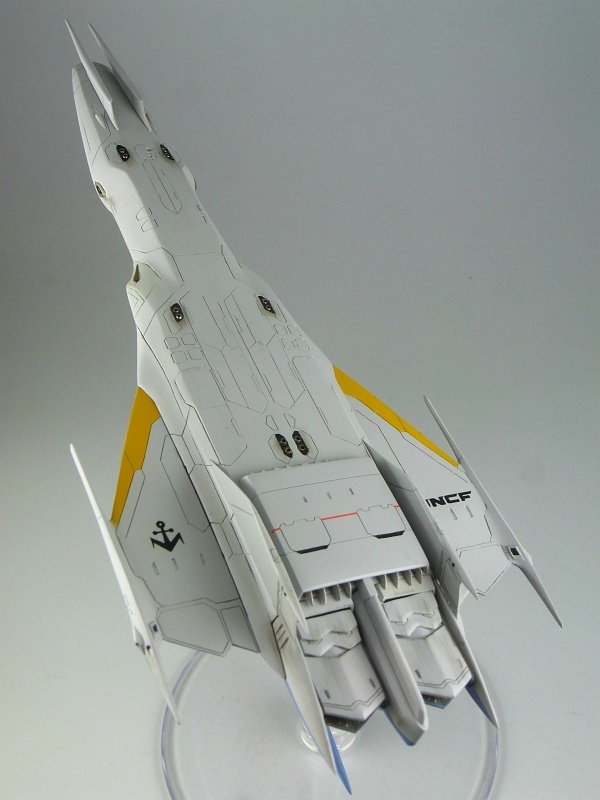 Stay tuned to this blog and the official Star Blazers website for more news and information on SPACE BATTLESHIP YAMATO: 2199 as they develop — and soon, we'll be off to outer space, with glue, putty, and paint! 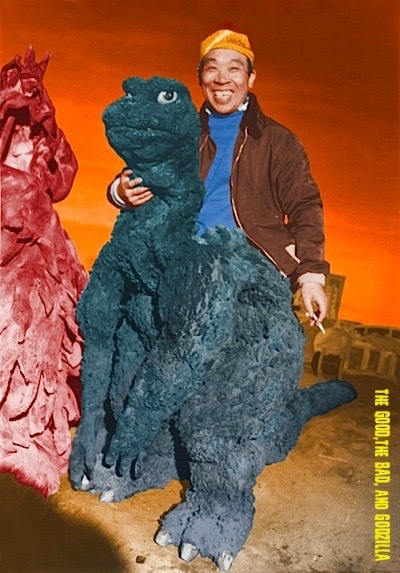 GODZILLA FANS, WIN A RONDO FOR NAKAJIMA! Don't you think that Godzilla himself deserves a Rondo? Then VOTE! Forget the inanity of the Academy Awards® and those flaccid Oscars© — it's time to voting for this year's nominees in 10th Annual Rondo Hatton Classic Horror Awards! Another year has passed, and I've again been humbled in being nominated thrice this time around! First, for my interview with Godzilla himself, Haruo Nakajima, appearing in Famous Monsters of Filmland #256 (an "All Japanese Monsters" issue in which I also served as Associate Editor). Then, another for my blog, The Good, The Bad, and Godzilla (which you are currently reading), for a fourth consecutive nomination! 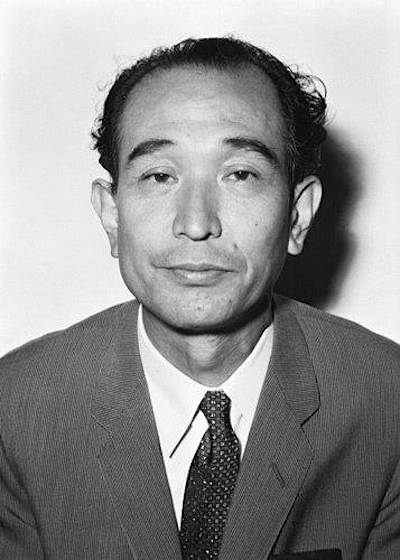 And last, but not least, for Mr. Nakajima's stage appearance at the Monsterpalooza convention last April, for which I presented and moderated (although I am not named on the ballot). There's a lot of competition every year, so please take the time to vote, because we have quite a few other deserving nominees, as always! Thanks for indulging me and let's get Mr. Nakajima a Rondo because he's a living legend and deserves it (I hope you'll vote in my favor, too — because I never win anything; and it would be cool to win a Rondo)! For a full listing of this year's nominees, your ballot, and how to vote, please visit the link below: All ballots must be received by Midnight on Sunday, April 1, 2012! Good luck to all of this year's Nominees! Japanese Blu-ray to Include English Subtitles! Spectacular Blu-ray Slipcase art by the legendary Naoyuki Kato! Anime label powerhouse, Bandai Visual, has announced that several upcoming releases, including the hotly anticipated remasters of the original MOBILE SUIT GUNDAM movie trilogy, will feature an English Subtitle option. One of the other titles to benefit from the inclusion of English Subtitles will be the highly-anticipated 26-episode series, SPACE BATTLESHIP YAMATO: 2199, streeting in Japan on May 25th (and apparently on copies sold exclusively at the theatrical screenings launching on April 7th). But, this option will only be offered on the Blu-ray (BD) release of YAMATO: 2199, and not on the DVD release. Rumor has it that the extras will also feature English Subtitles, which could not be confirmed at press time. The Subtitles for YAMATO: 2199 are being handled by US Expat, Sam Pinansky, a Translator, Producer, and Subtitle Engineer at Tezuka Productions. Studying Physics at Carnegie Mellon University and UC Santa Barbara, Pinansky joined Tezuka Productions in 2009, and has over thirty titles to his credit (including BEELZEBUB, GUIN SAGA, and COBRA: THE ANIMATION). On the Anime News Network, he divulged, "The first two episodes are amazing!" 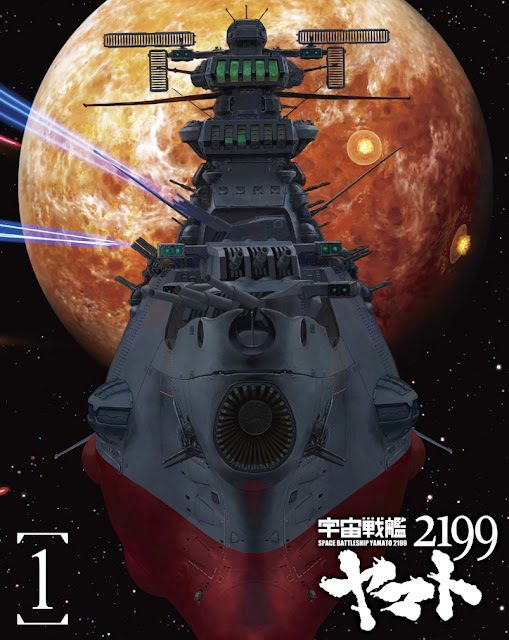 It is not known at press time whether the following six volumes of SPACE BATTLESHIP YAMATO: 2199 will continue with the English Subtitle option, but it's safe to assume that they will (or that Bandai Visual is planning on doing so, at the very least). More good news, if you weren't aware of it already, since Japanese and North American BDs share the same Region Encoding, all you need to do is pop the Japanese disc into your BD Player and go! So, US fans should not shy away from ordering their copies directly from Amazon Japan (which has a convenient English page option): click here to order your copy of Volume 1 today! Stay tuned to this blog and the official Star Blazers website for more news and information on SPACE BATTLESHIP YAMATO: 2199 as they develop — and soon, we'll be off to outer space, in your living room! Sneak Peak at Michio Murakawa's New Manga! Two unfinished pages for the first new Yamato manga since 1983. 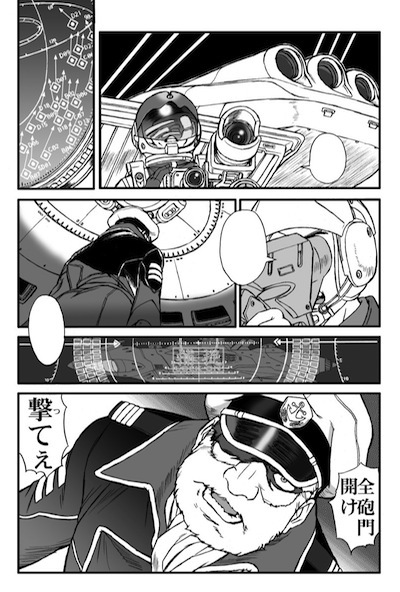 Over at his blog, professional mangaka Michio Murakawa (Robot), just posted a long update concerning his work on the adaptation of the upcoming SPACE BATTLESHIP YAMATO: 2199, which will be appearing in the pages of Kadokawa Publishing's NewType Ace monthly manga magazine. The 63-page debut will be featured in the April Vol. 7 issue, hitting Japanese booksellers on March 10th, and will continue in successive issues over the coming year in shorter installments. 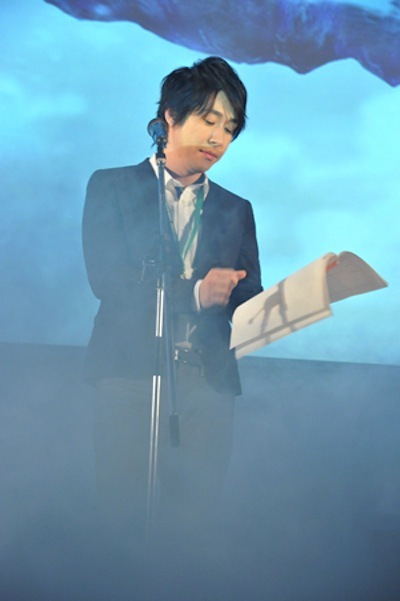 Murakawa is a diehard YAMATO fan who was hand-picked as one of the contributors for the Yamato Comic Anthology published to support the Yamato PlayStation games in 2000. He has also produced a series of self-published illustration books (Yamato: 2199, Yamato: 2201, and Yamato Reunion) with contributors including such famous alumni as Yutaka Izubuchi, Supervising Director of YAMATO: 2199. Murakawa writes about the trials and tribulations of tackling the first 63-page installment, for which he was hired last summer, and the trial and error process that he encountered; especially being such a fan and trying to create something fresh and original, despite his constraints and pushing his own abilities. The worst of these was the grueling schedule and the fact that he also had little support in terms of assistants to help ink, detail and shade his work. In order to meet deadlines, he worked it out that he would need to complete four to five pages of line art per day, for a total of two weeks. But, with the amount of detail, especially in terms of the battleships, and in terms of his own speculation vs. the finalized designs, all he could achieve were about three pages per day (which burdened him with an extra week added to his own timetable). Not being able to meet his own weekly goals, he said he felt like a fool for ignoring the prophetic advice of his colleague, Miki Matsuda (Unlimited Wings): "Never underestimate the Mecha." 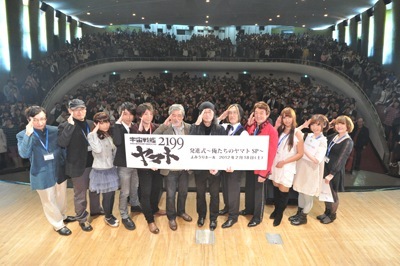 While he received an unprecedented amount of cooperation from the staff of YAMATO: 2199, in terms of the teleplays and storyboards (as well as viewing the first two episodes), Murakawa decided to create mostly disperate angles in his panels, and also, to elaborate on character situations, even the character designs, which was encouraged by the producers. This allowed him to stretch his imagination in creating the manga (and to take his own pride in the job) — which was his motivation in becoming a mangaka in the first place. He noted that he rendered most of the art in freehand, including the hard mechanical elements, such as Radar Screens and the interiors of the spacecraft, which was a challenge. 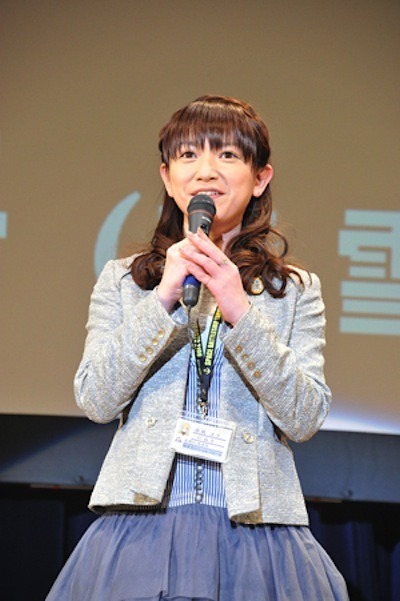 Murakawa noted that the density of this work is unlike others, such as the current Gundams, which comes from being from an entirely different generation. He then wrote that the job was akin to being waist-deep in a 40-year old sake. And a particularly tasty sake at that. But, that he was also overwhelmed on account of the depth in the collusion of the elements which are used to create the animated versions, including music, voice acting, photography, and so on. 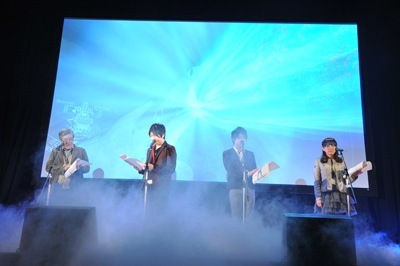 In conclusion, Murakawa stated that it was unbelievable to see his name in the end credits, because Yamato has been in the forefront of his dreams since Middle School; even though he realizes that it would be impossible to go aboard, since it is a ship that exists in a realm far beyond his generation. 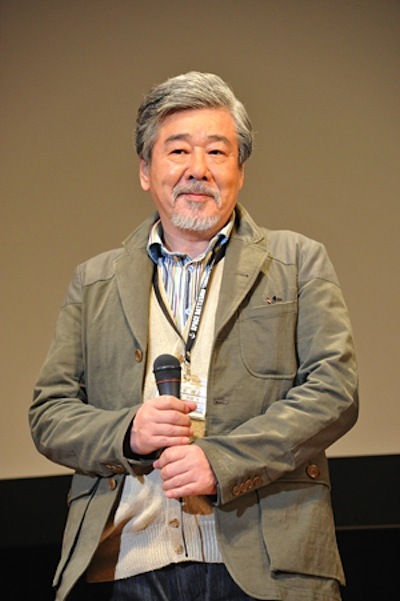 While he acknowledged that his manga will be something that the next generation of fans will inherit, along with the feelings of the crew of the Yamato, he also expressed his hopes that those who read his adaptation will come away with something memorable. His blog entry ended by expressing his wish that, "I'd still like to take a ride on that ship, someday." 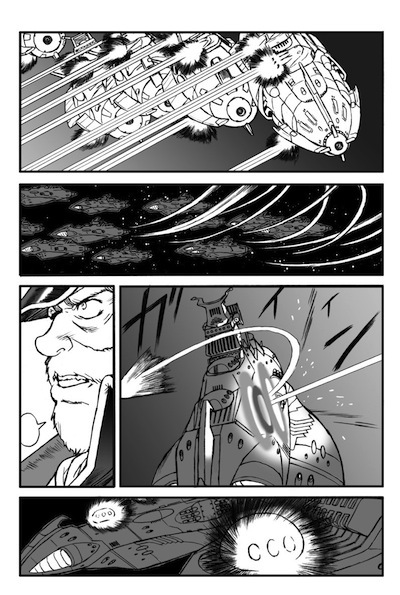 Stay tuned to this blog and the official Star Blazers website for more news and information on SPACE BATTLESHIP YAMATO: 2199 as they develop — and soon, we'll be off to outer space, in the funny pages! 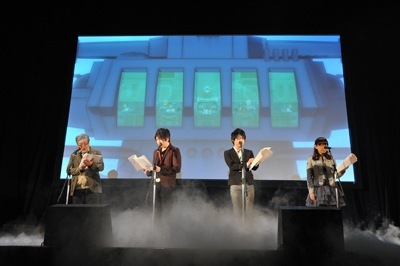 Photos from the Yomiuri Hall Launch Event! Hail, Hail, the Gang's All Here! What the Dessler Do We Care?" Actor Takayuki Sugo plays Captain Juzo Okita! Voice Actor Daisuke Ono plays Susumu Kodai! 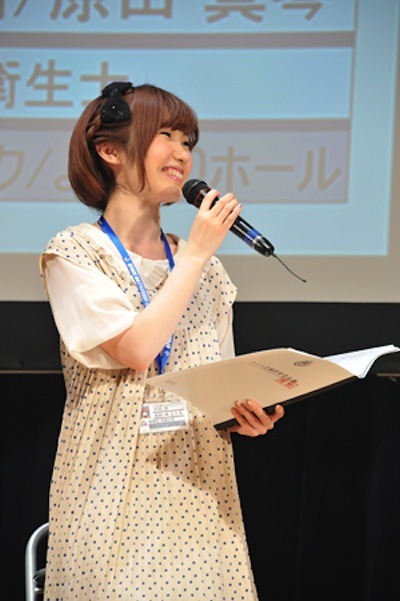 Voice Actor Houko Kuwashima plays Yuki Mori! 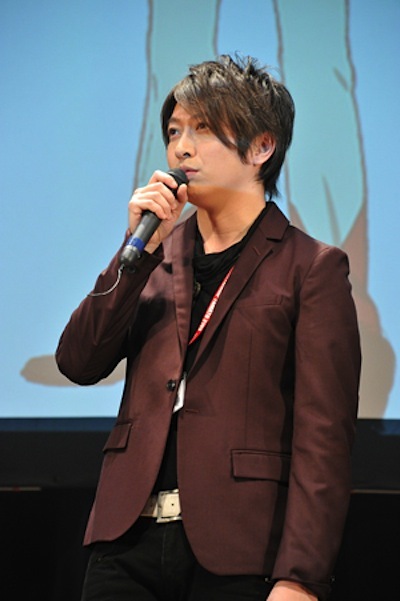 Voice Actor Kenichi Suzumura plays Daisuke Shima! Live Voice Over performance on stage! Is that the Floating Continent? "Target Scope, Open! Prepare for Anti-Flash and Anti-Shock!" "...5...4...3...2...1...0! Firing the Wave Motion Gun!" 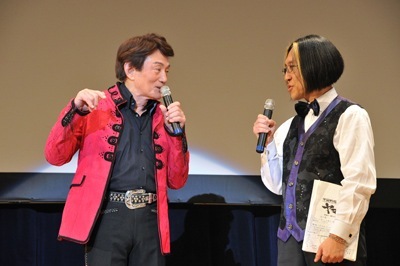 Legendary Vocalist Isao Sasaki & Music Composer Akira Miyagawa! 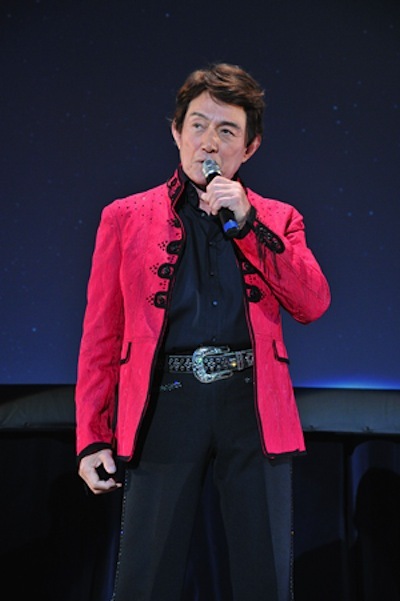 Isao Sasaki sings the original Ending Song, "The Scarlet Scarf"! Airai Yuki sings the new Ending, "In the Eternal Light of the Stars"! 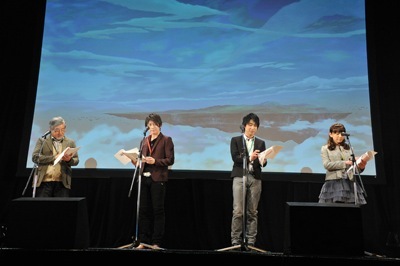 Rina Sato, who plays Makoto Harada, moderates one of the sessions! Stay tuned to this blog and the official Star Blazers website for more news and information on SPACE BATTLESHIP YAMATO: 2199 as they develop — and soon, we'll be off to outer space, just like old times!